I'm 3 weeks late with this report but better late than never. Remember, you can view bigger/higher res verisions of all the photos by clicking on them. 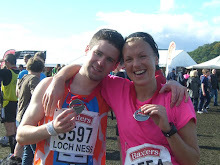 Since the Edinburgh Marathon in May, the two big races that I’ve been building up to are the Loch Ness Marathon in October and the Great Scottish Run. 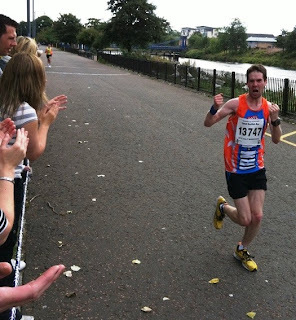 The GSR is an annual half marathon set in Glasgow, which gave it added importance for me. I also knew that plenty of the support crew would be able to come and cheer on me and Lynsey and that other friends in Glasgow might spot me as well. I was really looking forward to lining up in George Square and running through the heart of the city and some of its great parks, but I also felt under pressure to perform, being the largest mass participation sporting event in Scotland! 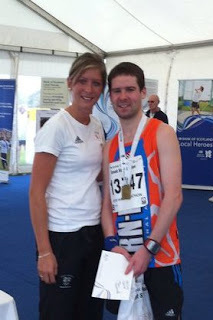 Having managed to finish a 10 mile race in 58:25 in July, my target for the half marathon was around 1 hour, 17 mins. My PB was only 1:22 though and it's a big ask to shave 5 minutes off a half marathon PB set as recently as March. However, I see no point in setting targets I know I can beat. I had ideal preparation for the race as I was able to stay at my friend Stephen's flat near Sauchiehall Street, within walking distance of the race start in George Square. 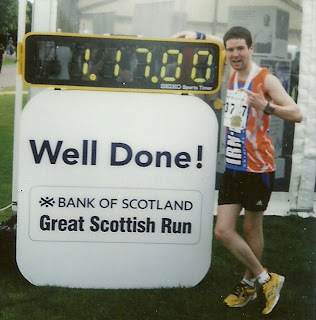 This made things a lot easier for me as I didn’t have to worry so much about how I was going to get to the race - once I’d got to Glasgow from London that is! On Sunday morning we had breakfast and headed down to meet my running buddy Lynsey and her boyfriend Ben. We then took our positions in George Square and waited patiently and anxiously for the starter’s gun. I always hate the hanging around before a race and just want to get started. George Square/St. Vincent Street throbbing, it's like Sauchiehall St! 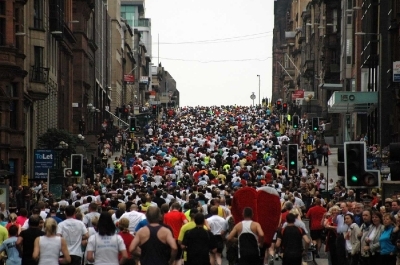 Finally it sounded and thousands off runners enthusiastically began their 13.1 mile journey to Glasgow Green. As usual I shot off quite quickly which just can't be helped with the adrenalin pumping through your body. I did the first two miles in only 5:40 mins each which is closer to my 10K pace than half marathon. However, I soon settled to closer to 5:50 which was a more realistic average pace. I was feeling OK in terms of energy but my calves were beginning to kill me already and I was questioning my choice of trainers - I was wearing my flatter ones seeing as this was a race but I haven't worn them for this distance before. I battled on. The support from spectators on the streets was absolutely tremendous, just as I expected it would be in Glasgow. I even had an old friend from Glasgow shout out of the window of her top floor flat at me which was unexpected and amusing! And another as he was just walking along the street! Little moments like these always give you a big boost. There was the added bonus of bagpipers dotted around the course which never fails to uplift and inspire. I even got high fives from a couple of neds on Paisley Road West, so I really got the full Glasgow experience! 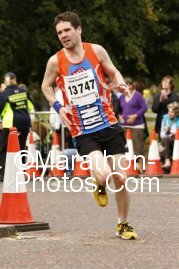 For much of the race I was running alongside another runner wearing the purple vest of the Bellahouston Road Runners running club. 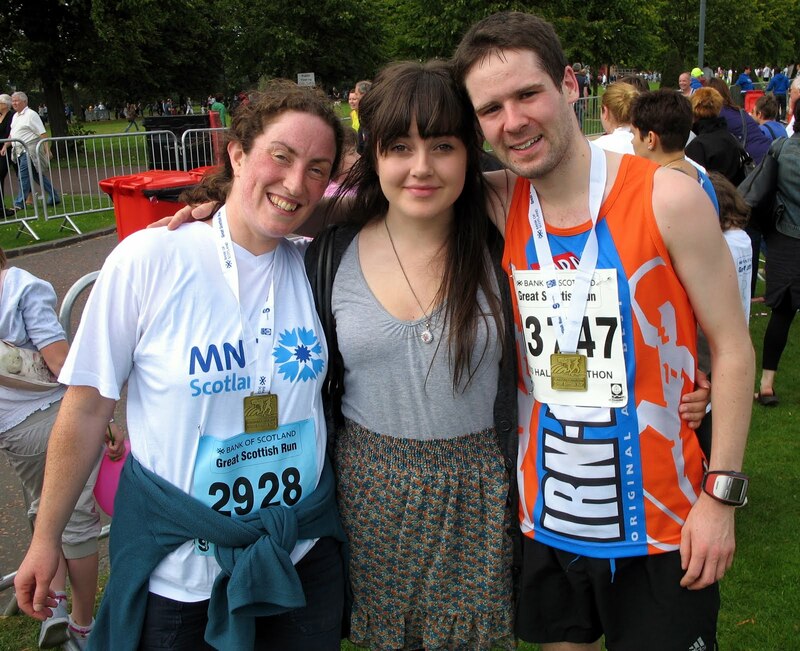 So there were many shouts of “’Mon the Bella!” and “Go Irn-Bru man!” along the course. I can't emphasise enough how much of a difference the support makes. I also think people cheering on others who they don't even know is a great example of human nature. I get quite emotional during my races as you can probably tell! 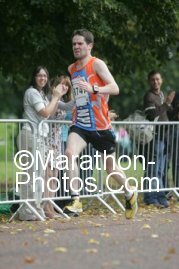 I actually began to feel quite comfortable at the 10 mile mark, although it helps when you know there are only 3 miles to go! Sometimes you just get a second wind though and by the final 2 miles I was flying again just like I was at the start. I left the Bellahouston Road Runner I had been following for dead - eat my dust Bella! Then I came into Glasgow Green. I hit a straight which I assumed was the finishing straight but it turned out there was still another turn to go. When I finally got onto the final straight I went up another gear but I didn’t really hit the booster button until I spotted my mates Steve and Steve. You can actually see this exact glorious moment in the below photo! I swear this made me go faster and shaved quite a few seconds off my final time - it was all sprint from there on in! The final straight was quite heavily lined with spectators on both sides and the noise seemed quite deafening at the time. In fact, after the race I learned that quite a few of my friends and also my dad and cousins had been cheering me on but a combination of being in the zone and the sheer noise around me made me oblivious to this at the time. Finally I was finished and was hit with a number of emotions, but mainly relief. Relief that it was all over but also relief that I’d done myself justice and put in a fantastic performance. In fact it is my best running performance to date and my progress continues. In stark contrast to Edinburgh, I felt quite fresh after the race and wished I’d started my sprint finish a little earlier! The trickiest task of the day turned out trying to find the rest of my support team among the thousands, but eventually we were reunited after a few announcements over the tannoy. Another friend, Rebecca, who had done the 10K race in the morning, works for the Bank of Scotland who sponsor the event and had a marquee set up. Here Rebecca introduced me to the lovely Eve Muirhead, the champion Scottish curler. This was rather embarrassing but a good moment all the same and she did seem genuinely impressed with my time. According to my friend Voogy, she has a very good golf handicap and if you believe Wiki, an accomplished bagpiper! After all of that excitement we headed to the city centre for some well earned scran and an alcoholic beverage or two! A very successful and pleasant day all round. Cheers Glasgow, and brace yourself Nessie!